The last thing most homeowners want to do during this challenging economy is spend more than they need to on a home improvement project. 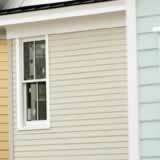 However, if the time has come to replace your vinyl siding, what are your choices? Many families head down to their local home improvement store hoping to catch a siding sale, but there are a few other avenues open to those in the know. By doing a little legwork, you might find the potential savings can make it well worth your while. Talk to a contractor. Siding contractors often get discounted prices on their material from distributors they deal with in large volumes. They can probably buy vinyl siding for much less than you can and may even have some on hand they would sell for a bargain price. Take a road trip. Just because you live in a large urban area doesn't mean that's where your siding must be purchased. A pleasant drive in the countryside might result in finding some small rural siding retailers who would be more than willing to negotiate on prices to move some inventory off their shelves. Don't forget to add in shipping if you don't have access to a truck. A familiar name isn't everything. Big siding manufacturers do a lot of advertising and most homeowners know their names. While these companies have good products, there are other vinyl manufacturers that may be less familiar, but also have high quality siding at lower prices. Ask your local distributor about Royal and Norandex vinyl siding products. Shopping at your local home improvement superstore might be convenient, but it's not always the best method for finding low vinyl siding prices.